My oldest daughter is an eater. She has her days, of course, and she has certain foods that she doesn’t care for, but all in all, she loves to eat. While crackers and bread top her favorite foods list, she also frequently requests craisins and tomatoes. Am I just lucky to have such a great eater? I don’t think so. I believe that it has way more to do with how I am teaching her about eating rather than luck. When Sofía was 9 months old, I read the book French Kids Eat Everything *. This book explores the journey that one multicultural family took from Vancouver, Canada to a very small town in France. The woman that wrote the book, Karen Le Billon, said that when they moved to France, her daughters (ages 5 and 2) were atrocious eaters and barely touched anything that resembled a vegetable. By the end of the book and their time in France, her daughters were well versed in a variety of fruits and vegetables as well as many foods that North American adults would never think about eating. After reading this eye-opening book, I realized that I needed to be actively teaching my daughters about food. Without the example and knowledge of the parent, a child will not know how, what, when, where, or why to eat. It is up to me, ultimately, to get my daughters to eat food. If you think about it, it makes perfect sense. Children don’t come into this world knowing their ABCs or that 2+2=4. We have to teach them those things. The same goes for food and eating habits. You have to teach your kids or they are always going to struggle with this very simple, yet complex, topic. Parents: You are in charge of food education! Parents schedule meals and menus. Eat family meals together without distractions. You don’t have to like it, but you do have to taste it. Slow food is happy food. Eating is joyful, so relax! 1. They will only learn about eating habits at home. Teaching great eating habits to your children at an early age means that they will know better when they come to situations later in life where these habits are not prevelant. One day, your kids will leave the house without you holding their hands. Whether it’s at school or at a friend’s house, they will be introduced to very lax eating habits. With a strong foundation learned at home, however, they will be more likely to stick to what they know. 2. So they can lead a healthier life. These eating habits will be a lifeline throughout your child’s life when they encounter difficult choices about food. Without them, their choices will be poor and they can develop all kinds of health problems. Our culture teaches young kids that they should look a certain way in order to get any kind of attention. With all this pressure, some young people end up with anorexia and bulimia. 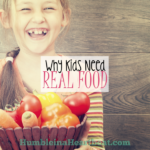 I think it’s more important for your kids to know how to eat well rather than to try getting a body that is really unachievable without being unhealthy. 3. You can expect less mess. Good eating habits include eating slowly and properly. This means that you probably won’t have as many messes to clean up off the floor and from their faces and hair. 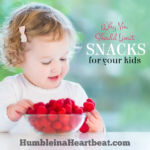 If your kids are also snacking less and at the table (instead of in the car or while walking around the house), you won’t have to clean up their crumbs everywhere else. 4. Your bank account will thank you later. Part of great eating habits is eating just the right amount, not too much and not too little. This often means you will probably start eating less food at meal-times, which means more ka-ching in your bank account. 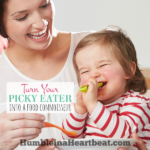 Another habit that you want your kids to develop is eating at specified times. No more grazing and requesting food at bedtime. This also cuts way back on how much you are spending on food. 5. Everybody will be happier. 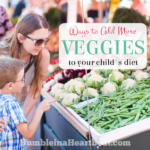 Are you a little more convinced that you need to teach your kids healthy eating habits? Oh I am super convinced I need to teach them better eating habits. We snack alot. We have crumbs every where. We eat dinner together at the table. BUUUUT. . . sometimes we eat lunch in front of the TV. I eat randomly and usually on the go. Hmmm it’s no wonder my kids are such terrible eaters. This post is kind of a big wake up call to me. But man oh man there will need to be a lot of changes. So perhaps I’ll baby step it. Great info! And also LOVE the picture. Pinning this. Good for you, Charlotte, for teaching your son such important habits. Thanks for visiting! I am 100% behind you on this, Charlee. We introduce our son to a variety of healthy foods over and over again. Even if he doesn’t like something, I will continue to prepare it for our meals and offer it to him. I read it can take up to 10 times for a child to taste something before he will eat it and enjoy it. We’ve always fed our son exactly what we eat. He doesn’t get special “kid” food. I think that book sounds amazing. I’ve heard of it so many times, I think I definitely need to check it out. You are so diligent, Lauren, I love it! I used to give Sofía her own special food until the baby arrived. I was making her food a whole lot healthier than ours, though! I can’t say enough great things about that book. It’s fascinating! 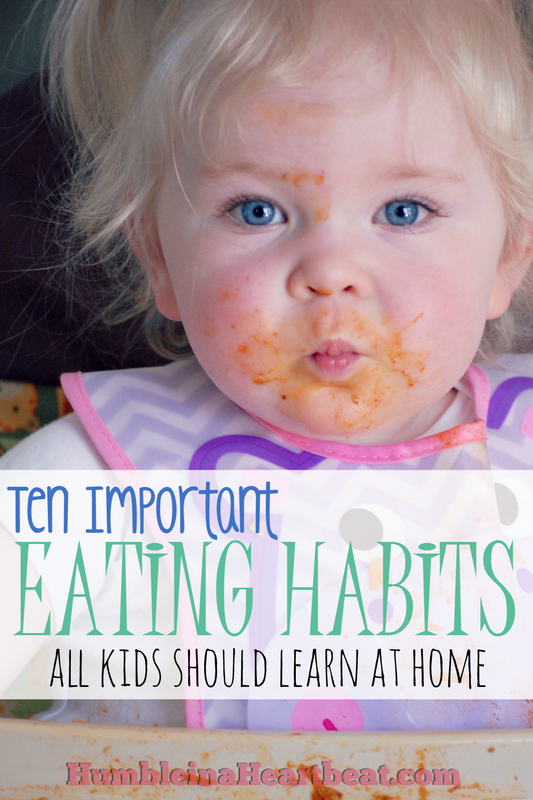 I am super convinced we have to teach our kids healthy eating habits among other things, because like many other habits, those start at home too. We can’t just rely on our kids to know what’s good for them when it comes to food, any more than we can rely on them knowing what the letter A looks like. Great tips Charlee! Exactly! I’m somewhat baffled when I hear about kids that are choosing what they get to eat for their meals. Unless they really know what is good for them, they’ll always choose the salty or sugary option! 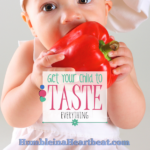 I love this post and it is so true we have to teach our children good eating habits! My kids will basically eat anything, but there are some foods they just don’t like. Truthfully there are some foods I don’t like, so I get it. My kids are grazers when they get home from school, so to avoid mindless snacking I usually have fruit and vegetables as snacks so that it fills them. I have also moved dinner up one hour earlier as that also seems to quell the grazing tendencies. Keep it going my friend, love this new series! Thanks! That is so great, Jen! I agree that if you are going to let your kids graze, you should provide them with healthy options. Wonderful post!! I’m totally going to read the book! First of all…trying to get a school picture of Dylan is proving to be a huge task because all I’m getting is action shots! I am definitely trying to get Dylan into eating everything but my husband is a problem. He’s the pickiest person in the world and his “ew” faces are terribly encouraging. Oh my gosh, I know how it is! These toddlers are much too active for us old people 😉 Too bad your husband is ruining the eating experience, Rebecca 🙁 You should teach some eating habits to him! HAHAH! I know right :[ I wish it were possible but he’s as stubborn as they come. I call my husband my garbage disposal because he will eat ANYTHING! Luckily, he tries to get LB to try new foods that I just don’t think of. To our surprise, LB will eat several bites of whatever it is Cambre is giving him to try. I also want to avoid snacking in the car. 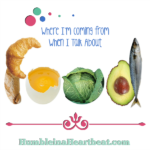 I just don’t want to deal with the mess… My grandma used to get so frustrated when she didn’t like certain foods. She would say “I’ve practiced and practiced liking ________, but I just can’t! LOL! Funny Grandma! That is really awesome that LB is a great little eater. This is the best time to get him trying new foods.